Popularly Known artists, Willy Paul and Bahati have not been in good terms for a while now and since 2014 the two have been seen exchanging bitter words on social media. The gospel artists later on took to social media to brief their fans that there beef was over and are getting along well. Well their sentiments seem to have been just a foul play to their fans as the two are still not seeing each other eye to eye. 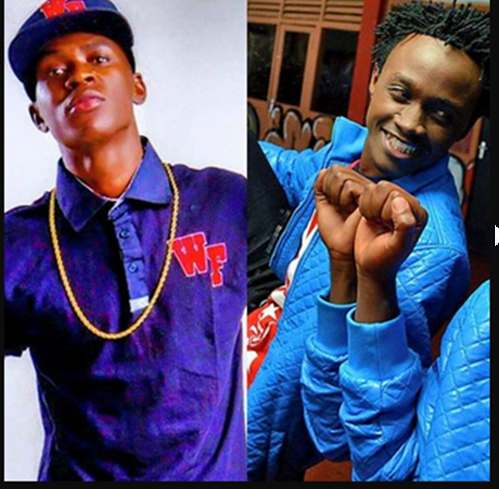 In a lengthy facebook post, Willy Paul accused Bahati of tainting his image so as to gain more fans and publicity. Apparently, Bahati had accused Willy Paul of leaking a song they did in 2014 but decided that they won’t release it after a disagreement over ownership rights and royalties. Willy Paul claims that he didn’t leak the song and Bahati is just tainting his image to win public sympathy. It’s so unfortunate how my brother is fighting me even after I released a peace song saying how much I love him. I've tried so much to make peace with him but from what I see, he's not ready for peace. We've met severally took photos which I always upload to show our fans that we are okay and we don't have any beef.. He's never posted any because he wants the innocent fans to keep fighting each other coz it works for him that way. I've grown up with him and I know him in and out. All the lies he's told the media are just a secret kept by me coz I want only the best for him. Last year when groove awards was approaching, he made up a story and claimed that I had stolen a song from him.. I received insults, was called all sorts of names.. By the innocent fans who didn't know that it was only one of his stunts to win groove awards... I kept quiet even after he called me a thief in front of the whole world. Everything will come to the open one day..
Last month he made up a story about DADDY OWEN a man of God that we all respect, he said that DADDY OWEN only used denno for his own selfish gains.. On the song MBONA and then dumped him.. I did a song with him back in 2014 and we disagreed about something and I called the collabo off!! And we both told the producer to delete the project. Now we are in 2016 and my brother is still after me. Accusing me falsely.. Saying that I leaked the song to WhatsApp groups, why is it always about you and me? Why am I the only person you attack with your lies? Did I ever wrong you somewhere?? Well if I did then sorry of which I don't think I have. So today after you leaked the song and said that it was me, what were your expectations? Are you not tired of seeing people insulting me because of your lies? Don't you think its wise to set a good example to the people who look up to us?? Why do you want our fans to keep fighting? One more thing, if its true you believe and have evidence that I leaked the song, why didn't you call me?? Why my brother, why?? Why did you run to the media?? That's what you always do to keep yourself relevant and that's not a good thing man. The fact that I did not respond when you accused me of stealing does not mean that you take advantage of me. Stop using my name for your own gains bro, come seat with me, talk to me, tell me your problem.... I might be able to help and if I can't am sure we can find someone to help... You've really messed my day up bro. I did not expect such from you. What you do to a brother today will be done to you tomorrow.